Overview: An integrated laboratory suite designed and built for geochemical research in all areas of environmental geosciences. The laboratory suite is named after Professor Julius Berend Cohen, an experimental chemist who performed pivotal research that highlighted environmental issues in Leeds in the early 20th century. This integrated laboratory suite has been designed and built for geochemical research in all areas of environmental geosciences. The facility operates as a collaborative and flexible space with specialist facilities and a supportive culture. We offer logistical support, assistance with analysis, and method development research. We have all the facilities that would be expected in a well-equipped geochemistry laboratory including centrifuges, hot plates, incubators, a freeze dryer, autotitrators and spectrophotometers. We have access to a rock crushing facility and thin sections workshop for sample polishing. In addition we have facilities for working under controlled atmosphere (e.g. anaerobic) and controlled temperature conditions. Our laboratory houses excellent facilities for the preparation of extracts from natural sediments, soils, silicate minerals, and waters, either to determine concentration or as preparation for isotopic analyses. We conduct iron, phosphorous and sulfur speciation through aqueous-based extractions of mineral-bound phases, including pyrite, within sediments. We have a long standing track record of stable isotope analysis of carbon, sulfur, nitrogen, and oxygen in a wide range of materials with applications in a number of fields. We have two mass spectrometer systems and a range of vacuum line preparation facilities. Our Flame Atomic Absorption Spectrometer (AAS) allows us to quantitatively measure the concentrations of elements present in aqueous samples. We also carry out ion chromatographic analysis of aqueous samples for cations. These techniques are complemented by our close work with the faculty Aqueous Analysis Facility giving us access to ICP instruments capable of analysing a wide range of aqueous samples in concentrated and complex matrixes. In addition, we have analytical facilities for quantification of carbon, nitrogen and sulphur in solid samples using our combustion analyser. This allows us to carry out total and organic carbon analysis. Our geomicrobiology laboratory is used for researching microbial processes in natural systems. The laboratory is able to work with microbiologically active soils and sediments and is a Containment Level 2 Laboratory. We have culturing facilities for aerobic and anaerobic microbes. Our purpose designed laboratory handles a wide range of environmentally relevant radionuclides. 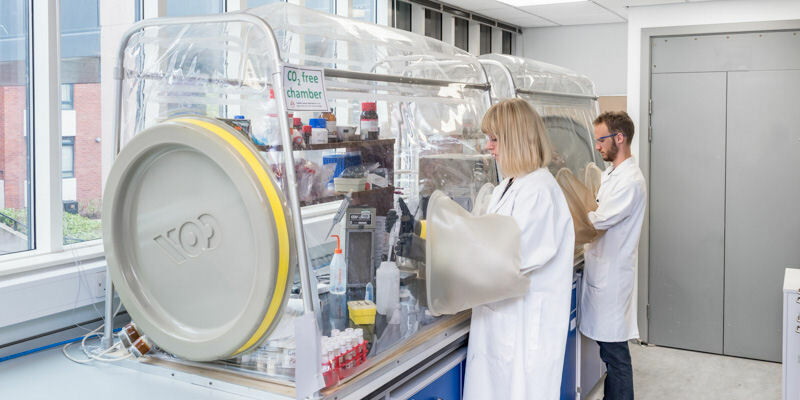 Our facilities enable us to carry out active experiments with a wide range of natural materials (soils and sediments) and minerals under controlled conditions (temperature and atmosphere). We have facilities for organic extractions and sample processing as well as analytical facilities including Gas Chromatography with both a Flame Ionisation Detector (GC-FID) and a Mass Spectrometric (GC-MS) detector. Our facilities for nutrient analysis include a Seal Analytical AutoAnalyser III, which we have set up for simultaneous analysis of phosphate, nitrite, total oxidised nitrogen and ammonia. We also have a Thermo Dual Channel ICS-5000+ Ion Chromatography System set up for measuring anions including chloride, nitrate, sulfate, and phosphate. We have facilities for measuring solid materials for properties such as surface area using BET, mineralogy using powder X-ray diffraction, and atomic structure using FTIR and Raman.